(view spoiler)[At the end of book 2, after Gilfeather killed Morthred, everyone was shocked to find people falling out of the sky – people who had only moments before been sentient Dustel birds, suddenly released from Morthred’s spell. Dustels across the Isles of Glory are now human – but having been born as birds, they can’t walk, talk, recognize one another, or communicate as humans. Some are driven out of their minds with fear, while others succumb to the elements they don’t know how to protect themselves from. I thought this was extremely well thought out on Larke’s part. Just because they can understand human doesn’t mean they’re able to make a seamless transition to being a human. Ruarth is constantly missing the ability to fly, even forgetting and trying to fly when he’s distressed. Ruarth’s constant references to not being able to tuck his head under his wing, staring at his feet, or having to remember he can move his eyes without moving his whole head reinforce the idea that the Dustels are no longer humans in a bird’s body, but have become birds in a human’s body.Our favorite Dustel Ruarth did manage to get to a safe place on board Flame’s ship before Gilfeather’s killing stroke. Flame is almost completely overtaken by dunmagic, being continually subverted by the unborn child of Morthred she carries. She is determined to go back to the Bastionlord and convince him to marry her, and then by using her magic, convince him the child she carries is his, so that he can rise to power and rule the Isles of Glory. Ruarth wants to protect her long enough for Gilfeather to find a cure, and in rare moments of lucidity, Flame begs him for her own death. My heart broke for Ruarth throughout the book, because subverted-Flame mocks him, threatens him, and promises to kill him, and he knows that even if they cure her, even if they succeed, she’ll never be able to live with all that she’s done and all that she’s said. He wants to save her even if it means that he can’t be with her, and knowing they’ve spend decades as friends and would-be lovers and now that they’re finally both the same SPECIES but it won’t work out? Augh the FEELS. (hide spoiler)]The Tainted introduces two new narrators: one is our framework narrator, the former love interest of the ethnographer who conducted the interviews we’re reading as the story. Having secretly read the unedited interviews, she’s determined to meet Blaze, whose life of freedom and choice is so different from her own life of stuffed up propriety and restriction. The second narrator is a young man named Elarn, a young man and slyvtalent who works as a tiderunner (sort of a kayak-based message carrier but way cooler) between his home island and the Keeper Hub. Elarn gets caught up with Gilfeather and Tor Ryder, who have been studying Awarefolk and slyvtalents to see how magic is passed genetically in order to isolate a “cure” for magic so that they can save Flame and anyone else subverted by dunmagick. Larke weaves in character discussions from previous books regarding the Menod belief system and the precarious political relationships between the Isles and the Keepers who regulate them. One thing Larke handled well was the relationship between the characters who believed in so many different things. Ryder had his opinions, as did Blaze and Gilfeather, but they all got along and respected one another.The ending was exciting, and the Isles of Glory have been forever shaken by the actions of our half-dozen heroes. The framework narration by the girlfriend and Blaze in flashbacks explains the Change and ties up all the loose ends. Still, there were several characters who I thought would die but didn’t, making me think that maybe Larke just couldn’t bear to kill them off after three books. 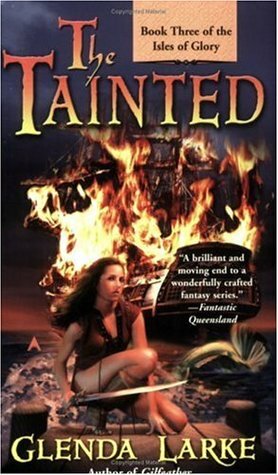 Still, I was satisfied with the way she resolved the plot and the relationships and especially the Change, which was ambiguous right up until the end.I didn’t care for the cover for this one, simply because Blaze isn’t around quite as much in this book and burning pirate ships, while visually exciting, are not indicative of the plot overall. Of course, I could say the same for Flame being the cover character for Gilfeather, while holding a sword which I don’t recall her doing often, but really that is all more the publisher’s fault. Ms. Larke told me that she’s hoping to get these released as e-books soon, so maybe that will come with a cover revamp. ;)All in all, 3 stars for an excellent conclusion to a series I really liked! I’ll be spreading the word about this one for sure. typisch Glenda Larke „Die Inseln des Ruhms - Die Magierin“ von Glenda Larke ist der letzte Band dieser Fantasy-Trilogie.Der Dunkelmagier Morthred ist getötet, die Dunstigen sind jetzt Menschen und Flamme trägt immer noch Mortheds Kind im Leib. Flamme ist zwar nicht so bösartig, aber sie versucht ein ganzes Inselreich unter ihre Kontrolle zu bringen um dann die ganzen Inselreiche beherrschen zu können. Ruath, Glut und ihre Freunde versuchen jetzt Flamme zu retten und die Dunkelmagie zu vernichten.Auch dieses Mal erzählen die Protagonisten ihre Geschichte den Kellen, die ja Jahre später die Inseln besuchen.Flamme ist ab und an für kurze Zeit sie selbst und kann Ruath um Hilfe bitten. Doch die meiste zeit wird sie von der Dunkelmagie beherrscht. Sie nutzt sie zwar, aber nicht so skrupellos wie Morthed. Sie bindet nicht immer komplett, sondern beeinflusst die Leute immer nur leicht. Sie denkt und plant auch ganz anders. Es macht sie dadurch nicht weniger böse, aber sie geht es sachter an.Ruath hat jetzt mit seinem menschlichen Körper zu kämpfen. Es ist sehr ungewohnt für ihn. Er muss vieles lernen, wie auch das Sprechen. Es ist aber gut beschrieben wie er damit zu Recht kommt. Auch sein Konflikt wird gut beschrieben. Auf der einen Seite möchte er Flamme erlösen, aber auf der anderen möchte er sie nicht töten, denn er liebt sie.Das Buch ist wieder typisch für Glenda Larke. Starke Persönlichkeiten, welche ihre Welt verändern, um etwas Besseres zu schaffen. Es gibt wieder viele Überraschungen im Handlungsverlauf, die den Leser richtig mit fiebern lassen. Langeweile kommt nicht auf. Man bekommt Geschichte aus teilweise fünf Perspektiven zu lesen, was auch notwendig ist. Wobei es sich auf zwei Handlungsstränge konzentriert.Am Anfang musste ich mich erst wieder einlesen. Denn es ist schon etwas her, dass ich die ersten beiden Bände gelesen habe. Es war aber wieder mal schön etwas von Glenda Larke zu lesen. Es hat mich gefesselt und Ruath ist mir dieses Mal richtig ans Herz gewachsen.Es gibt von mir 5 von 5 Wölfen! Four and a half stars. This is such an excellent trilogy, and it's really nice to have found another fantasy author I love. Larke continues to address interesting questions in this book, particularly the two tiered society that magic creates so easily. Her writing reminds me of Robin Hobb - the character development is superb, the world building excellent, and the series comes to a very satisfying conclusion. More Glenda Larke books, please! This last book wraps up some loose ends that the previous book failed to answer, although it does raise some new questions.In this story we find out what happens to Flame and what happened to the Ghemps, although that question is answered somewhat weakly. I was impressed with how well Larke wrapped this story up although I would love to see another book detailing Anyara's travels. An excellent ending to an excellent trilogy; looks like I have found a new fantasy author!! My only complaint is the cover designs on the paperback books I read; half-naked women with swords does not portray the characters in any of the books!! I want to know what happened to everyone after. An interesting story, filled with action, love, sorrow and hope. A beautiful melding of real cultures and peoples that make for a compelling read. I'm a sucker for these stories. Final book in the Isles of Glory trilogy. Brings all the threads together in an enjoyable read. great book from an audience author. will definitely be seeking out more of her work. I enjoyed the whole series. Tantalizing, thrilling, mysterious and with a proper ending that will leave you satisfied. Can't wait to visit the Isles of Glory again in years to come! Glenda Larke - Glenda was born in Western Australia, the daughter of a farmer. She was educated at government state schools and the University of Western Australia, where she obtained a degree in history and a diploma in education. Married to a Malaysian scientist, she has grown-up children, and now lives in Malaysia, where she is actively involved in rainforest conservation. Author of The Isles of Glory trilogy (The Aware, Gilfeather, The Tainted); The Mirage Makers trilogy (Heart of the Mirage, The Shadow of Tyr, Song of the Shiver Barrens) and, writing as Glenda Noramly, a stand-alone book Havenstar.